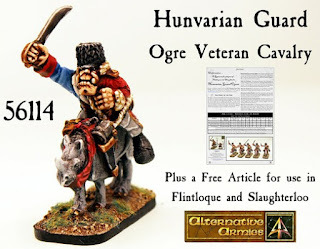 Brand new Ogre Cavalry for Flintloque and Slaughterloo. 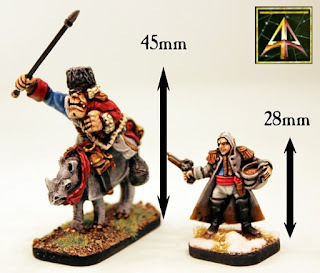 Hunvarian Guard on Rhinos which can be used for Guard or Hussars, Hunvaria or Krautian Giant Legion. All resin unit and at a reduced price. Single, Pack or Unit. Also a free article with game statistics for the new units. Click through to see and learn more plus the download link and remember our Black Friday mega event is underway too with free shipping and a whole lot more until 29th November. All in the article. Something that has always puzzled me is l'ordre mixte. Supposedly this formation combined the advantages of line (output of fire) with those of column (handiness). Yet the reality of l'ordre mixte is that you still have a line between two columns. Thus if it wanted to stay in that configuration the formation would have to move at the pace of the slowest, i.e. that of line. The line in question would probably move even more slowly than a line because it's effectively extended in length by the additional frontage of a column at each end. If it was important that these remain aligned, these would make it more cumbersome than one line. Was its supposed advantage something else entirely, or was it as I've said and I've just not understood it properly?
? yes it would have the movement disadvantage of a long line. The thing to remember though is that disadvantage is a function of training. Well trained troops will maintain a moving line much better than poorly trained troops, something that most rules do not reflect. Also the Hunvarian ogres are just what I need to support my pugs in the SYW and heavy ogre cavalry in the later Mordredian wars. Yes, basically what Artilleryman said. I can't recommend Quimby's "The Background of Napoleonic Warfare" highly enough if you're interested in questions like these. I guess if you formed up in l'mixt you probably took care to have the line bits facing clear terrain and less in need of delays to dress the formation. As others mention, the move capacity of the whole was perhaps a secondary consideration. Nice new addition to Hunvarian army.